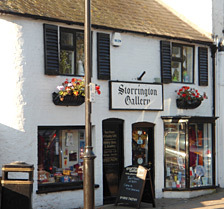 Storrington including Stable Antiques, Petworth, Lewes and the Lanes area of Brighton. There are frequent car boot sales in the area too. 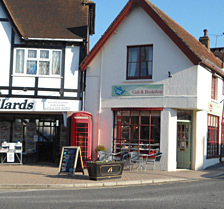 Many beaches in each reach of Sullington including Climping, West Wittering, Brighton and Littlehampton. Most are mainly shingle (pebbles) but have sand at low tide. Littlehampton and West Wittering are the more sandy. 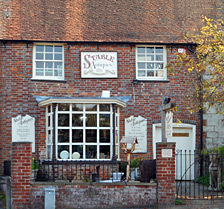 There are many lovely places to eat and drink in Storrington, 13 Church Street (pictured in the banner) is one of our favourites offering freshly prepared fine Thai cuisine for a sophisticated evening out, 13 Church St is opposite the The Old Forge Restaurant which is another great but very different restaurant. The Old Forge also run a deli. For a freshly brewed afternoon cup of tea and delicious cakes try Vintage Rose on the High Street. Gardens that can be visited easily from Sullington Manor Farm include Parham House, Nymans, Ramster, Denmans, West Dean, Weald & Downland Open Air Museum (gardening through the ages) Wakehurst Place, Borde Hill, High Beeches, Parham House and Wisley. Days out for children include Fishers Farm Park, Coombes farm rides (especially at lambing time), Southwater Country Park, Bluebell Railway, Legoland and Chessington. West Chiltington Golf course, West Sussex Golf course (members only). 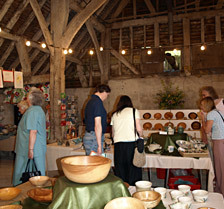 Historic houses that can be visited easily from Sullington Manor Farm include Parham House (Elizabethan), Brighton Royal Pavilion (Regency), Petworth House (Georgian), Batemans (Rudyard Kipling’s home), Preston Manor (Victorian), Weald & Downland Open Air Museum (over 50 historic buildings representing the homes and workplaces of the South East of England from medieval to Victorian), Anne of Cleeves’ House (Tudor), Lewes Castle (ruins), Arundel castle, Bramber Castle (ruins). 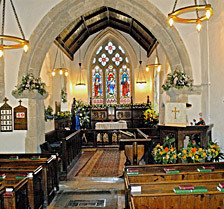 There are stables at Arundel, Ashington and Horsham. Hove Greyhound stadium (dog racing), Goodwood, Fontwell, Plumpton, Brighton (horse races). 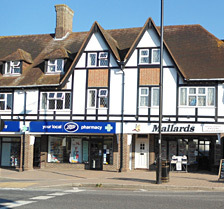 Towns with plentiful shopping include Guildford, Chichester, Brighton with lots of very individual shops in the North Laines area and Gun Wharf Quays at Portsmouth (discount outlet). There are enormous shopping centres at Lakeside and Bluewater. Amberley, Arundel, Brighton, Chichester, Guildford, Horsham, Lewes, Petworth, Shipley and Storrington Steying – all with something special to offer.